When visiting Sicily, make sure you bring a wind-breaker–and really, I mean a wind-breaker (For non-native English speakers, this is a jacket that prevents wind from cutting right through your bones!)! 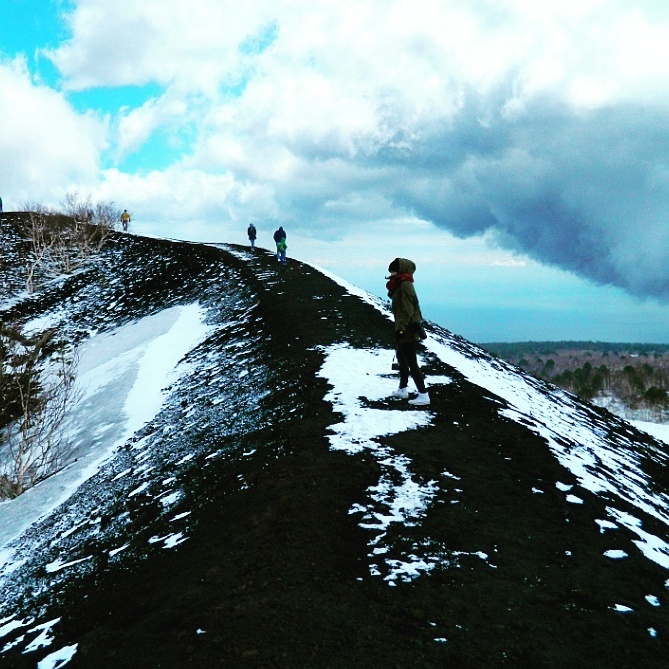 Because on the rim of this crater on Mount Etna, the winds will knock you over. But how thrilling to feel nature’s power! Here on this rim, I learned first hand why in Roman mythology, Vulcan is not only the god of fire, but also the god of winds. Our local guides will be leading us on Mount Etna on Day 8 of Experience Sicily’s September Enchanting Sicily tour. We’re starting to fill up this small-group tour! Contact me for more details or visit http://experiencesicily.com/2015-tours for all of the details. Wow, in Alabama? I wonder how that came about? Nevertheless, it’s a great image–protecting the city from the top of the hill! I wonder that as well! Who knew there were enough Italians (or maybe classics professors) to imagine Vulcan protecting the city. Yes, a windbreaker, and a prayer to not be blown off the ridge! But worth the views!